Today on the unofficial Winter 2014-15 Spell Blind Blog Tour I have a very special post up at the website of Lucienne Diver, writer, agent, friend. The post is an interview with Namid’skemu, a character from Spell Blind and the other volumes of The Case Files of Justis Fearsson. Namid, as he is known, is a runemyste, the spirit of a Zuni shaman and weremyste who was sacrificed centuries ago by the runeclave and imbued after his death with enormous magical powers. He is now a guardian of magic in our world and he is Justis “Jay” Fearsson’s mentor in all matters relating to spellcraft. He is not the most effusive of beings and getting him to sit down for an interview was not easy at all. So I hope you enjoy this. You can find the interview here. 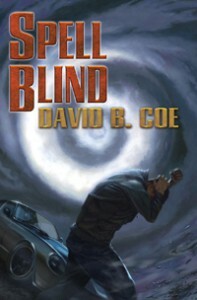 Today, I am back at Magical Words with a post about character and character relationships in Spell Blind, the first book in The Case Files of Justis Fearsson. The post is part of my continuing unofficial Spell Blind Winter 2014-15 Blog Tour. You can find the post here. I hope you enjoy it. One of Those Posts . . . This is one of those posts. And by one of those posts I mean a post that is going up for the sake of keeping alive a promise I’ve made to myself to try to blog about something every day. Thing is, I don’t have a lot to say. I worked today. I got out for a walk and saw a few birds (a beautiful Red-shouldered Hawk and a small flock of Swamp Sparrows, which happen to be among my favorite winter residents). I watched a little football. When I’m done with this I plan to play a little music. A relaxing, quiet day, of which I have had way too few recently. And I don’t see too many more such days in my immediate future. So I’m going to enjoy this one. Forgive the brief, pointless post. See you tomorrow.